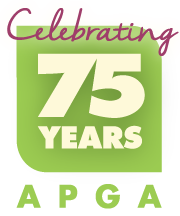 In 2015, the American Public Gardens Association celebrated 75 years as the preeminent association for public garden professionals. At this time we were reminded of the instrumental role our members played in the Association’s past, present, and future. We thanked all members that had contributed to our story, welcomed new members to help build our future, and shared fond memories, proud historical moments, and exciting progressions. Celebrating 75 Years and New Strategic Plan! Bartlett Tree Experts, Berends Hendricks Stuit Insurance, Dean Runyan Associates, Event Network, J. Cobb Group, Lark Label, Mundus Bishop, Origami in the Garden, Plants Map, Inc., Porous Pave Inc., Retail Control Systems, Rosedale Nurseries, Inc., The Acorn Group, The Davey Tree Expert Company, Universal Services Associates, Inc., Walt Disney World Orlando, Florida. Feeling nostalgic? We’d love to hear all about your favorite memories/experiences of the Association. Send these stories electronically to Communications Assistant, Lauren Garcia Chance, at lchance@publicgardens.org or share directly on the Association Facebook page!